After my fellow editor Michelle highlighted Simplicity’s new “Pattern Hacking” line in her curvy pattern round-up in April, my interest was piqued. What exactly did they mean by pattern hacking? I associate pattern hacking with making changes to a pattern that go above and beyond what’s described in the instructions or on the pattern pieces. How would a pattern hacking pattern work? It seemed like a bit of an oxymoron to me. A Simplicity sale at Joann and our own Pattern Hacking Month gave me the perfect opportunity to indulge my curiosity. Always on the hunt for the perfect pant, I opted to try Simplicity 8378, an elastic-waist knit pant pattern with wide and narrow leg options. As you can see from the pattern cover, Simplicity has technical drawings for several “hacks” for each pant type. For the slim leg pant, there is the option to crop the pants, add side slits or insert elastic for jogger-style pants. For the wide leg pant, options for angled or high/low hems are pictured. When I saw the technical drawings, I assumed that Simplicity would provide just the basic pattern, as well as some narrative instructions on these “hacks” (like “cut at an angle from the inseam to the outer leg, 8″ up from the hem” or something to that effect). However, when I opened the pattern, I found that the pattern pieces themselves have markings for these “hacks” already drawn onto the tissue, and separate pieces for some of the “hacks,” like the curved high/low leg! To me, this is not pattern hacking, but merely a pattern with multiple “views,” no different from a traditional Simplicity or Big 4 pattern. The only other difference of note was that the pattern included a third pattern sheet with no pattern pieces, but covered in a 1×1″ grid. I guess this is meant for future hacks? Size range: XXS-XXL; up to a 41.5″ waist and a 50″ hip, which is equivalent to Simplicity’s size 26. What size did you make? I opted for the narrow leg pant and cut a size XL. My measurements put me in between sizes L and XL, so I went with the bigger one to be safe. What adjustments did you make and how long did they take? I wasn’t planning on making any adjustments, but in the end, after trying them on, I decided to shorten the pants by 1.5″ at the hem because they were just too long (I’m decently tall, but my height is not in my legs!). I probably could have shortened them even more, as they’re a big saggy at the bottom. I also felt the plain hem pants turned out a little bit boring and overly slouchy, so I added the elastic in the bottom hem, which was one of the “hacks.” I left off the in-seam pockets because I loathe in-seam pockets. What was the construction process like? The construction process was very straightforward. It’s a dead simple pattern, but even if you chose one of the “hacks,” none of them significantly complicate the construction and would add only minimal extra sewing time. Did the instructions make sense to you? I found the instructions to be interesting. I don’t sew a ton of Simplicity patterns, but I have sewn a few in my day. It seems that Simplicity has adopted a more casual, conversational tone for this pattern’s instructions (maybe in response to the indie pattern companies?). Lots of typos and grammatical errors, though, as well as some awkward wording. It felt a little bit like they were trying too hard to be cutesy. The instructions were pretty straightforward, though. As with most Big 4 patterns with multiple “views,” the instructions jump back and forth between views. Additionally, the “hack” instructions are sprinkled throughout. How do you like the pattern’s fit? Do you think the design works well for your particular body shape? I think the fit is fine. They’re a little bit big for me, but, as I mentioned, my measurements had me smack in between two sizes. Sizing up to XL made them a bit slouchier than the versions on the pattern cover. They were also a bit long, so I had to shorten them. Otherwise, they’re a pretty solid, basic pant. No weird crotch issues, a nice high rise. Will you make the pattern again? If so, what fit or design changes will you make? I might make them again, although I think I would try out the wide leg version and I might size down to the size L.
Do you have any advice on this pattern for other curvy sewers? Are there any resources (blog posts, fitting books, tutorials) that helped you sew this piece up? These pants are so straightforward to sew that I didn’t consult any additional resources. The pattern is basically the simplest pant pattern you could imagine – just front and back leg pieces, not even a separate waistband piece- so they would be a perfectly good beginner pants pattern. 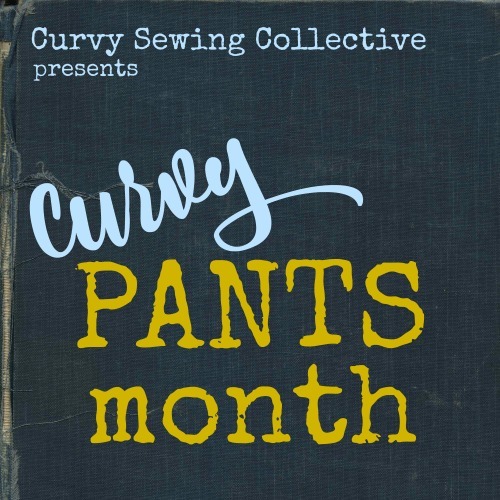 However, if you need extra support, I would recommend checking out our Curvy Pants Month posts, particularly the Pantsmaking Resources: Fitting and Construction post. Size Range: 4 The range is ok, but could be much more generous, especially in light of how simple the pattern is. Why not have these patterns go all the way up to through the plus sizes, Simplicity? Instructions: 4.5 The instructions are perfectly adequate and include directions on a handful of minor “hacks” to the basic pattern. Construction Process: 4.5 No problems with construction on this simple pattern. Final Fit: 4.5 Pretty much as expected, a good basic knit pant! Overall Rating: Hmmm… as a solid, basic knit pant pattern, I’ll give this a 4.5. However, I would give this a lower rating for the “pattern hacking” concept. I don’t really feel that this pattern is any different from a traditional pattern with multiple options/views. Maybe I’m being harsh, but I don’t think the way its been done requires the requisite creativity that I associate with pattern hacking. I’m a total beginner and found this pattern in a flash sale, so I will be interested in how the process is. I hope it’ll give me a decent introduction into sewing in knits and sewing trousers that fit. Your review really helps. Also knowing it’s a far more casual look than the pattern illustration suggests, I feel positively validated in my urge to buy a OTT colourful print knit and make these fabulous stretchy pants of joy. Bye bye sensible camel shades of Ponte! I agree with you. I cannot see why patterns have to stop at a 22 or 24. There are so few patterns available in the larger sizes and those that are offered lack any true fashion. Companies seem to think larger just means a sack. 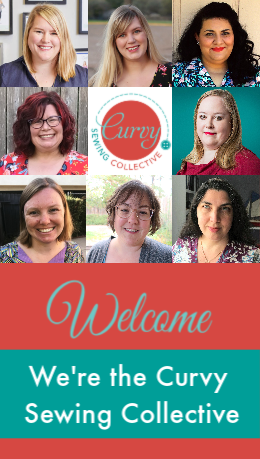 They are continually ignoring a large sewing community. I agree; particularly with a very simple design like this one, I don’t see any reason why they couldn’t offer more sizes! I spied this pattern and got really excited about it. Thankfully, I opened it and looked before I bought. I was disgusted with the description of it being a “hacking” pattern. They have made a pathetic attempt to usurp a major part of the DIY movement. It’s like their banking on less knowledgable sewists buying the pattern cuz, hey, it’s hacking, right? I don’t appreciate the attempt to dupe the buyer. Simplicity needs to give us more credit than that. Your pants do look relaxing though. If they just billed it as a pants pattern, I’d be inclined to buy. But I’m still mad about the deceptive description so I wont’. Hmm, yeah, it’s definitely using “hacking” as a marketing tool and the pattern is certainly geared towards beginners. But I do think it’s a solid pant pattern nonetheless! I’m old school, I like to say re-design. When I saw the patterns made by 100 acts of sewing I knew that I could hack them a million ways. It sparked creativity in me. The Simplicity pattern is not a hack. :o) The pants look so comfy, I like them. But from the pattern envelope drawing I imagined them more form fitting. I just bought Mizrahi’s V1554 with great hopes of lots of hack/redesigning! I can see how the term “hack” can be annoying… The pants are comfy! I definitely should have sized down, though. I hope you share your “hack” of V1554! Thanks for the review I’m unable to wear synthetic fabrics and knits and are always looking for a nice woven long pants pattern but not many around which fit my unusual shape. I have no idea what shape I am. But it’s cool they look nice on you. Thanks, Helen! Unfortunately, this is a knit pant pattern, so it might not meet your needs. 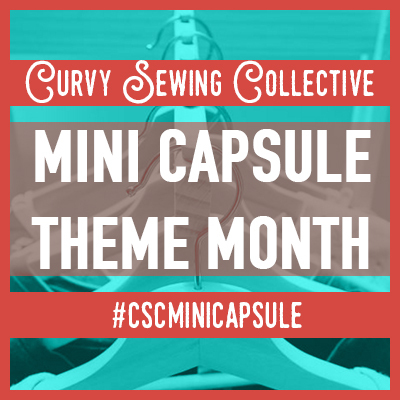 Have you check out our pantsmaking month posts, though? Lots of great ideas there! Yes Meg but nothing there. Thanks anyway as usual I have to keep searching. There isn’t much around for plus sized women who don’t fit into their box of sizes. Glad you’re enjoying the CSC, Lorainne! Sounds like you’ve got the skills to come up with something for your granddaughter! I read your comment “Grey just reads “sweatpants.” Personally, I don’t think it looks too much like sweatpants, but the gathered ankle look can sometimes give that illusion if there is too much drape at the ankle over the elastic. I’ve observed in RTW that there is less of that drape effect (check out Eileen Fisher’s TENCEL TWILL SLOUCHY PANT). Having said that, put on a sweatshirt and it might appear more like sweatpants. Styling it the way you did, it just looks casual perfection! Thanks! Yeah, I think the size and color are really making them feel too slouchy. But I am wearing them anyway!! I think it’s a good idea for a newbie intro to “hacking” and aren’t really sure about where to change something (e.g. that slimming a leg starts more at the knee…not the hemline) and how these new pattern lines gives you new style lines. And it could help someone envision the path to a different “hack”. At any rate, that fabric looks SUPER soft and they are comfy so that’s a win!! True- this is a much more reasonable response to their new pattern line than I had 😉 I should have considered it the training wheels of pattern hacking! I agree, when I saw the first of these patterns I thought riiight. But then somone I know as a beginer made herself something. She used what she had learned on another pattern, making it a true hack. Now I view them a little more fondly, more as an introduction to how to hack a pattern. I’m all for helping beginners cut their teeth and gain confidence. I know I’ll be enjoying what they do in the future. A friend’s daughter tried these as her first ever pants and loved them. It is interesting to read your review as someone with more experience. I love the idea of something this easy but I’m not sure how they will translate for my apple shape. It’s a great pattern for beginners, I think! I bet these could work for an apple shape. The elastic waist is flexible and you could slim the legs as necessary if you left the outer leg seam as the last to be sewn. Your pants are cute! Good to know on the fit. We have similar measurements so thanks for the heads up on sizing! After all that complaining, I have worn the pants a ton! I would definitely size down, next time, for a sleeker fit. I was going to write a long post, but Leigh you put it perfectly! Hacking is a very trendy word right now; I feel like it speaks to those who want the end result with the least amount of effort or money lol. My version of hacking is more like the Curvy Collective’s definition. I don’t mind the word ‘hack’ much, but it is EVERYWHERE. Simplicity is just cashing in on a trend. Meg, your pants look great tho! I love how you styled them. Thanks for the review! Thank you for the review. I saw the pattern hacking line and wondered about them. You answered my questions! I think I will stick to the basic pant pattern I am already using. When I was younger, we used to call this “pattern design.” Today, it’s “pattern hacking.” Same concept, different marketing to the younger generation. You all are fearless when it comes to cutting into patterns and fabric. So fun to be part of this group! It’s a nice pattern, I think! Probably not geared towards someone who sews as much as me. But it would be a great beginner pattern. Totally with you on the pattern hacking aspect of this pattern. When I looked at it my first thought was ‘isn’t this just a pattern with several different views?’ To me a hack is where I have to engage in some original thought, not just cut out the pattern pieces provided. Yeah, that was my thought, too. Although now that I have some distance and heard some other opinions on it, I’ll think of this as the training wheels of pattern hacking. They look very comfortable and a quick sew. I too am a pear shaped body and it is so hard to make something fit so right. I didn’t think that I could do elastic at the bottom, but that actually looks great on you. I will have to try it. Thanks for the review! Glad you found it helpful! I think it’s a pretty good pattern and very comfy. The joy of the elastic cuff is that you’re just sliding it through the hem allowance, so if you don’t like it, take it out!